There are plenty of statistical sites on the web. HawkBlogger.com is largely a journal of everything going on with the Seahawks over time. There are times that statistics help to tell that story, and that is why I created this Season Progress Report series a couple years back. A gap in the statistics out there is the ability to freeze points in time, and allow you to rewind and compare how the team has progressed or regressed as the year rolls on. Player splits (e.g., first half of the year vs second half of the year) are common, but team splits are less so, and quarter-season splits can only be found here, from what I know. I track every Seahawks game, and have for years. That allows me to break down trends over any period of time I choose. As this season continues, I will provide a progress report at each quarter point of the year, and highlight other trends I see in-between. You can review the quarter-point progress report here. If you are having trouble viewing the table below, try clicking this link. It can be difficult to separate the most recent game from the overall narrative of the season. Seattle just finished it’s worst offensive performance in recent memory and surrendered 200 yards on the ground to a Rams team that has not run the ball effectively all year. Just one game earlier, they dominated an Arizona Cardinal team that continues to show that win was more impressive than people realize, and allowed a minuscule 1.7 yards per carry. You see the offensive line surrender seven sacks, and forget that they had surrendered seven sacks combined in the previous three games. That is the purpose of these progress reports. Take a step back and look at the overall trends. None of them tell a whole story in isolation, but they each help to add context to what we are witnessing. 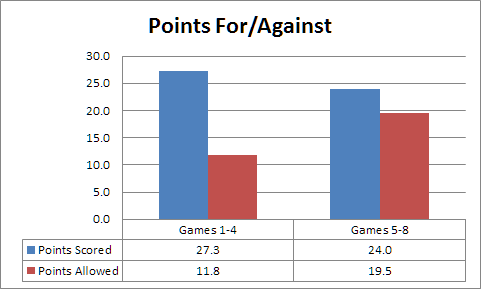 The trend in points, both scored and surrendered, looks troubling at first glance. Dig a little deeper. Three of the last four games were on the road. Yards per play, which is a great barometer of overall offensive and defensive efficiency, shows the Seahawks are holding pretty steady on both sides of the ball. 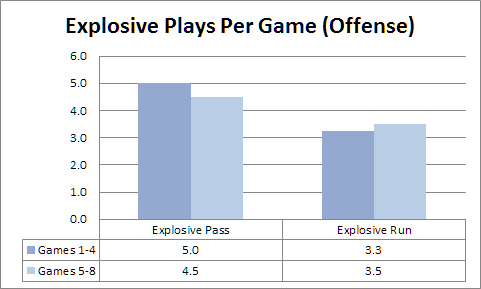 Explosive plays, which are runs of over 12 yards and passes over 16, can help show if the offense is being forced to dink and dunk their way down field, and whether a defense is keeping opposing offenses from quick movements. 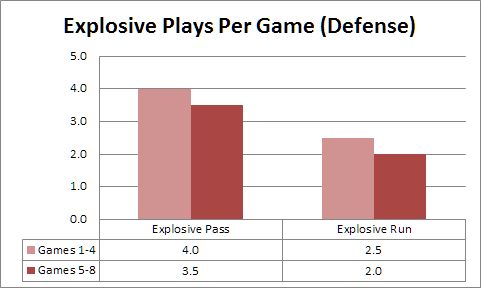 Again, Seattle has remained relatively steady on offense, while making a meaningful improvement on defense. Zac Stacy and the Rams managed a Seahawks opponent season-high with six explosive runs. 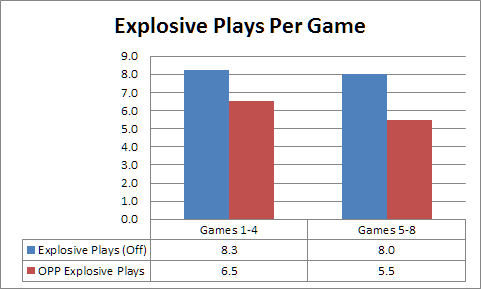 Opponents had only managed six explosive runs in the last four games combined, and none in the previous two. It is worth watching this, as a similar occurrence last year versus San Francisco became a harbinger of things to come on run defense. For now, the expectation has to be that the Rams game was an anomaly, but it bears watching. Situational play is a mixed bag. These are the moments that games generally turn on. 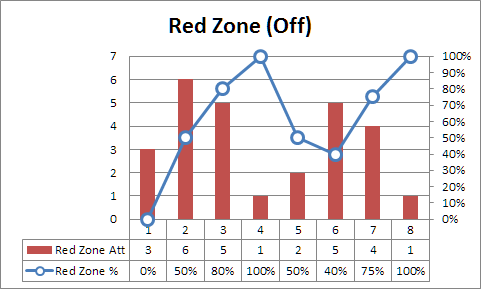 Seattle continues to struggle on third down offensively, but have improved their play in the red zone. 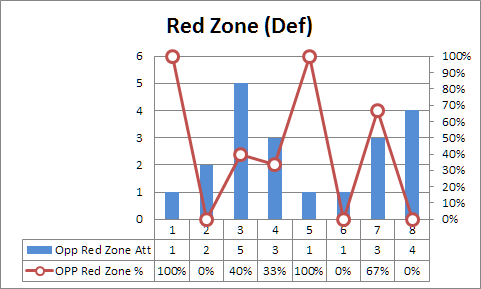 The defense has been incredibly consistent on third downs, outside of the Colts game, and have been among the stingier teams in the league in the red zone. 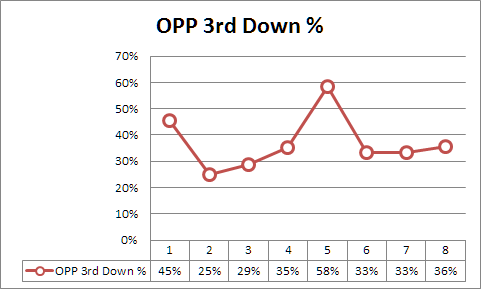 Offensive third down conversions may be the bellwether stat to watch. It will tell us if the team is in manageable third down distances, an indicator of better early run performance, and tell us if the passing game is functioning in the toughest situations. 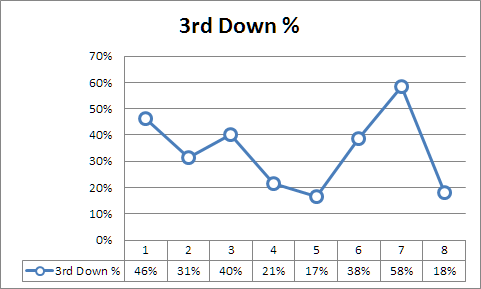 When the offense was humming the second half of last season, they were converting 48.5% of their third downs. They are at 33.7% now. They have only one game so far that was over a 48% conversion rate. The goal here has to be closer to 40% the next four games, and it needs to climb a bit higher once Russell Okung returns. 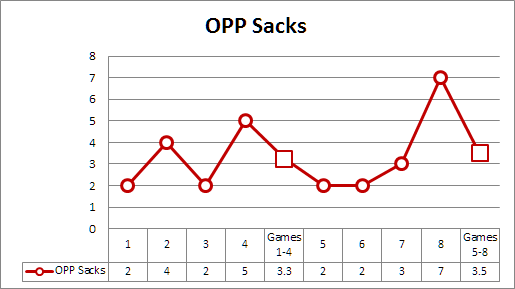 It is easy to overlook the pass rush with all the attention being paid to the pass protection woes. 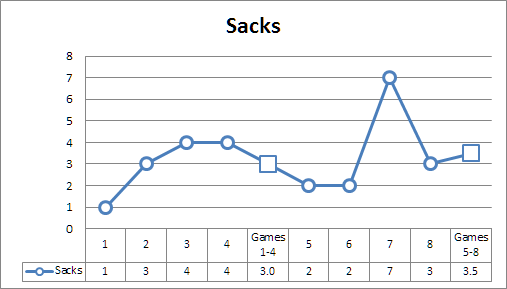 This defense is averaging a full sack per game more than they did a year ago, and are actually averaging more sacks on the road (3.4) than at home (3.0). That is a terrific sign, and a huge part of the turnover engine that is producing a league-best 2.6 takeaways per game. 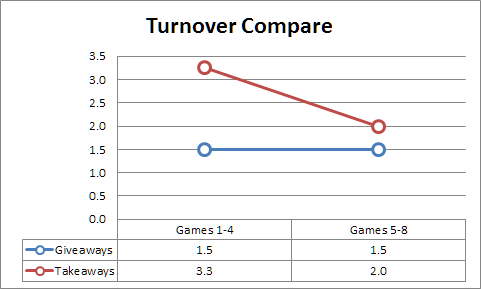 The team cannot rely on turnovers all year. There is always some amount of luck involved with taking the ball away, even with a dominant defense. Teams can increase their chances of creating them with a good pass rush and great coverage, but there are no guarantees. The offense needs to cut their turnover rate. They are almost a full turnover higher the first half of this year (1.5) than they were the last half of 2012 (0.6). Assume the defense is going to get fewer than 2.6 takeaways the rest of the year. 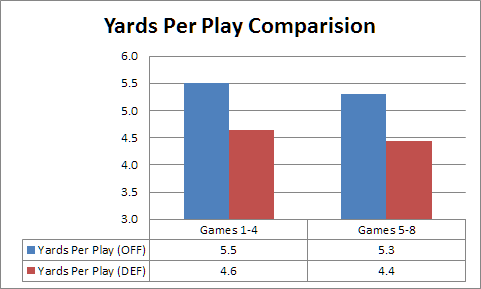 That means the offense needs to protect the ball better to maintain the advantage the Seahawks have enjoyed there. Three of the next four games are at home. It looks like Percy Harvin will miss at least two of those, and as many as all four. Okung could be back by the Minnesota game, and Breno Giacomini could also return in this stretch. Three of the four opponents have two wins or less. The only acceptable result in this next quarter of the season is four wins. Perfection is a tall order, and this team is showing some signs of weariness. The bye week comes after three more games. Even at 7-1, the Seahawks need a convincing win this week to get their swagger back heading into Atlanta. It is hard to see the Vikings winning here no matter how the Seahawks play. Go 4-0 here, and the team should be setup for a very strong finish if they can continue to gain players back from injury without losing others ones in the process.